Madrid members of Invisibles include neutrino phenomenologists such as A. Donini, E. Fernandez-Martinez, M.J. Herrero, M. Maltoni, A. de Rújula, nuclear physicists working on double beta decay (A. Poves), neutrino experimentalists (L. Labarga, SuperKamiokande), dark matter experts (A. Knebe) and gravitation/cosmology experts (E. Alvarez), plus their postdocs and students. Members of Invisibles include S. Abel, C. Baugh, C Boehm, C. Frenk, S. Cole, V Khoze, A. Jenkins and T. Theuns, plus their postdocs and students. Members of Invisibles include J. Hamann, J. Madsen and H. Fynbo, plus their postdocs and students. Members of Invisibles include: U. Ellwanger, Y. Mambrini, G Moreau, A. Arbey, P. Brax, S. Lavignac, S. Davidson, A. Teixeira, N. Mahmoudi, J. Orloff, S. Kraml, T. Lassere and M. Frigerio, plus their postdocs and students. Members of Invisibles include: M. Lindner (Heidelberg), G. Raffelt (MPI Munich) and W. Winter (Univ. 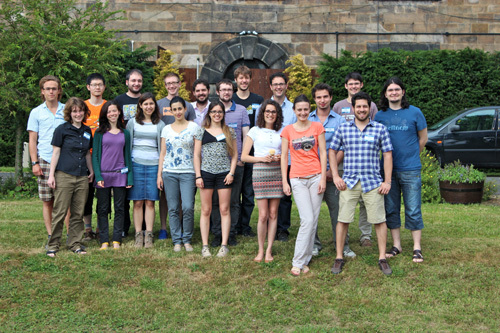 Wuerzburg), plus their postdocs and students. Members of Invisibles include: J. Niemeyer, W. Buchmueller, A Ringwald, T. Bringmann, J. Kersten and G. Sigl, plus their postdocs and students. Members of Invisibles include: A. Bettini, F. Feruglio, M. Mezzetto, M. Passera, M. Pietroni, S. Petcov, A. Romanino, P. Ullio, G. Senjanovich, A. Smirnov, C. Brofferio, S. Capelli, O Cremonesi and M. Pavan, plus their postdocs and students. Members of Invisibles include: G. Baremboim, O. Mena, C. Pena-Garay, N. Rius, M. Sorel, A. Cervera and J.J. Gomez-Cadenas, plus their postdocs and students. Members of Invisibles include: G. Isidori and M. Schumann, plus their postdocs and students. Members of Invisibles include: S. Belyaev and P. di Bari, plus their postdocs and students. Members of Invisibles include: H. Murayama and K. Okumura. Members of Invisibles include: D. Berge, C. Hansen, G. Servant, G. Altarelli and G. Giudice. Members of Invisibles include: K. Giboni, M. Messina, G. Tajiri, M. Stern, A. Melgarejo, R. Budnik, A. Rizzo, G. Plante, A. Loose, K. Lim, B. Choi, L. Goetzke and H. Contreras. Members of Invisibles include: A. Para, D. Bauer, C. Quigg, B. Kayser, S. Geer, A. Bross, R. Plunkett, B. Rebel, S. Zeller, S. Brice, C. Polly, P. Shanahan, J. Cooper, G. Rameika, C. James, B. Baller, D. Harris, D. Morfin, F. de Jongh, A. Sonnenschein and P. Cooper. Members of Invisibles include: D. Finkbeiner, H. Georgi, M. Reece, M. Schwartz and C. Vafa. Members of Invisibles include: G. Sterman, R. Essig, P. Meade, T. Corbett. Members of Invisibles include: T Schwetz-Mangold, L Bergström, and J Edsjö. Members of Invisibles include: I. Freire da Mota Albuquerque, G. Alberto Burdman and O. José Pinto Eboli. Members of Invisibles include: R. Gutierrez, G. Navarro and J. Beltran. Members of Invisibles include: E. Amr, L. ElSayed, E. Ahmed, A. Waleed y A. Mustafa. Members of Invisibles include: D. Choudhary. Members of Invisibles include: A. Dighe. Members of Invisibles include: E. Erfani, A. Rezaei Akbarieh, B. Kahvari and P. Bakhti. Membership of this group is open to organisations interested in being part of the network on an informal basis. There will be opportunities to share information, learn about project developments, workshops and activities, and to collaborate with members of our ITN. Members of Invisibles include: Particle Theorists: Mu-Chun Chen, Jonathan Feng, Arvind Rajaraman, Yuri Shirman, Tim Tait; Astro-particle Theorists: Kevork Abazajian, Manoj Kaplinghat; Experimentalists: Steve Barwick, Bill Molzon, Simona Murgia, Michael Smy, Hank Sobel, Daniel Whiteson, as well as their postdocs and students. *First line left to right: Valerie Domcke, Maria Archidiacono, Nassim Bozorgnia, Ninetta Saviano, Valetina de Romeri, Ilaria Brivio, Marija Kekic and Daniel Mayani. *Second line left to right: Johannes Bergström, Takashi Toma, Michele Lucente, Aaron Vincent, Pedro Machado, Mark Ross-Lonergan, Thomas Neder, Giorgio Arcadi, Kirill Kanshin, Peter Barrow and Miguel Hierro. Invisibles is a European ITN project (FP7-PEOPLE-2011-ITN), which focuses on Neutrino and Dark Matter phenomenology and their connection. Experimental and theoretical aspects are also encompassed. The network involves nodes in seven European countries and its associated partners extend to seven non-European countries. Neutrinos and Dark Matter are the most abundant particles in the universe and yet they remained unnoticed -invisible- until recently, due to their tenuous couplings to the ordinary matter we are composed of. Neutrino masses inferred from neutrino oscillations and the existence of dark matter constitute the first evidence ever of particle physics beyond the Standard Model. A wide experimental program focused on the properties of both type of particles is underway and key new results are becoming available. The road to build the New Standard Model of particle physics is open: a theory which must encompass the nature and properties of neutrinos and dark matter, besides those of ordinary matter. The mission of Invisibles ITN is to form the new generation of young researchers which will accomplish this task. This is the first transnational program, overcoming the European fragmentation on these topics. Optimal in gender balance and role models, with over 60% female and mostly junior international leaders as coordinators. For a list of network members (at full or associated partners) and friends of the network, please click here.